This project went through quite the evolution before I finished with it. 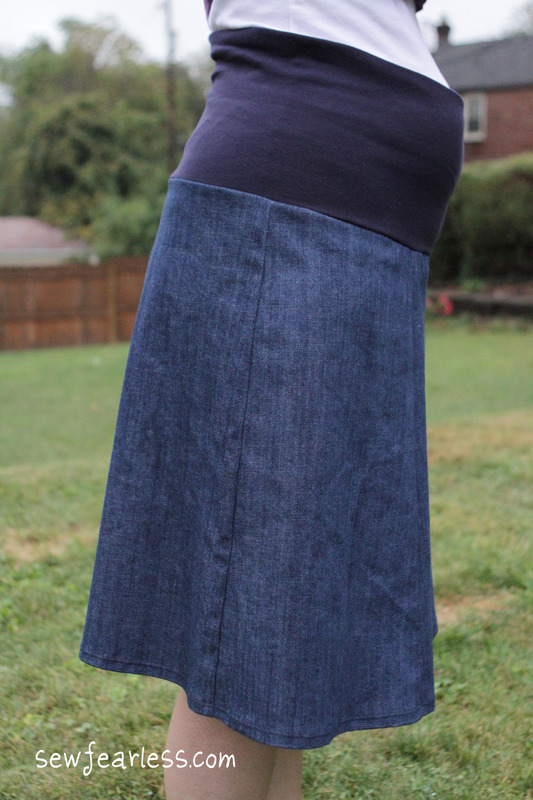 First, I wanted to make an Old Navy Rollover Skirt knock off with interlock instead of jersey. I was planning on using this beautiful full skirt as a starting point, but the interlock wasn’t wide enough for the pattern. Then, I bought a black stretch denim which I instantly regretted because of the color and its inappropriateness to the pattern. 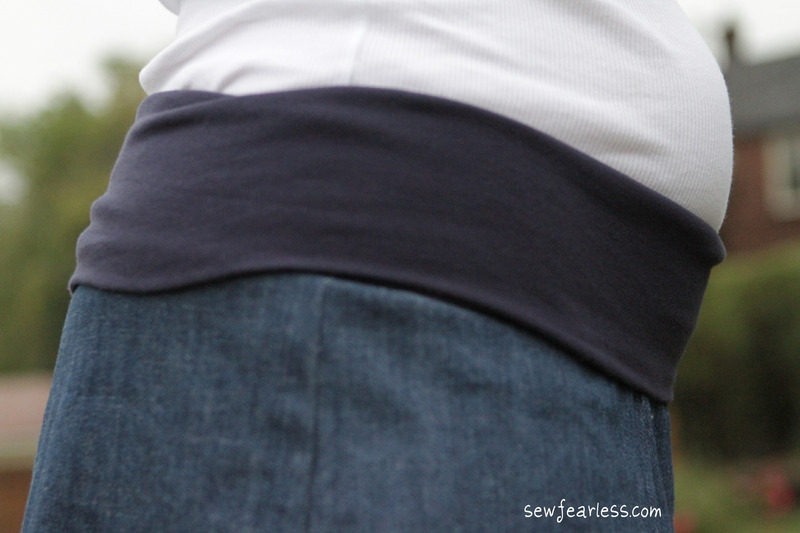 A final trip to a larger fabric store gave me the lightweight (9 oz) navy stretch Denim above and Butterick 3134. Before I give you all the details, I wanted to share with you another project I have been working on these last few months. It has also thrown off my Project 12 sewing plans a bit. I thought I was going to tailoring pants by now! God has other plans I suppose. 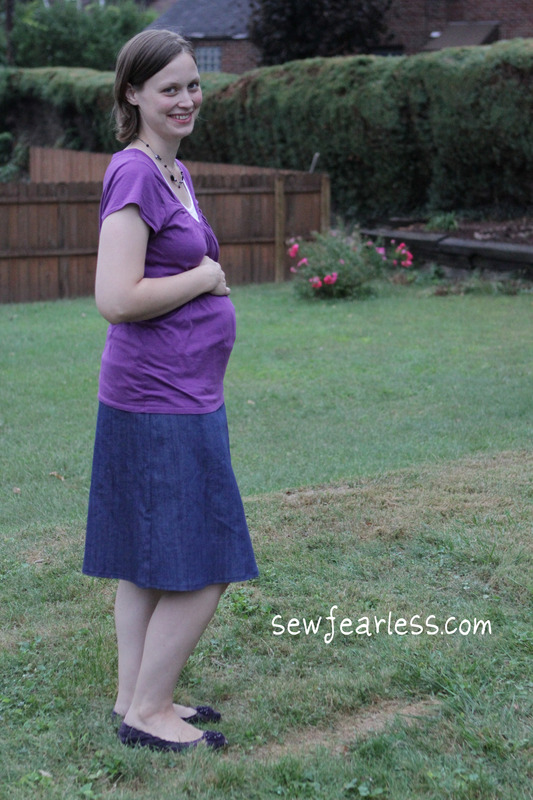 Instead, this month I learned how to convert a skirt pattern into a maternity skirt. Man, is that waistband super comfy. It is made of a cotton/spandex tubular rib knit. 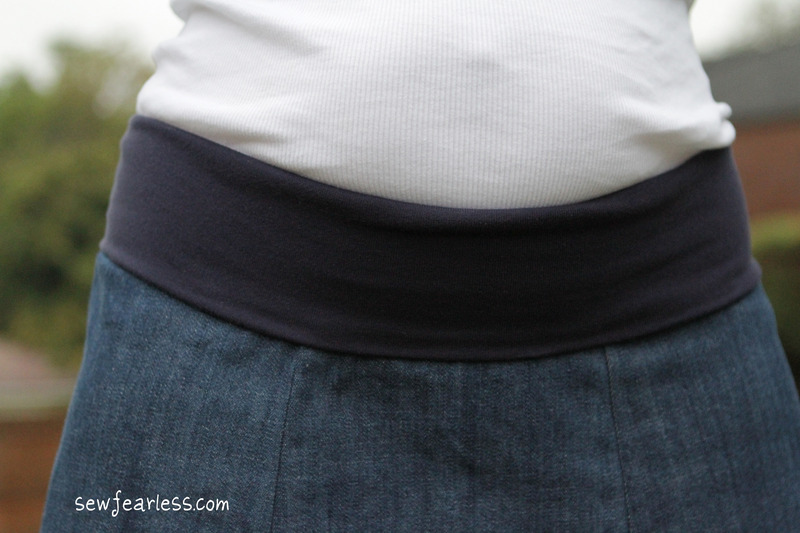 Even without elastic added to the waistband, it is grippy enough to withstand tugging toddlers. The waistband is extra tall for continued growth. 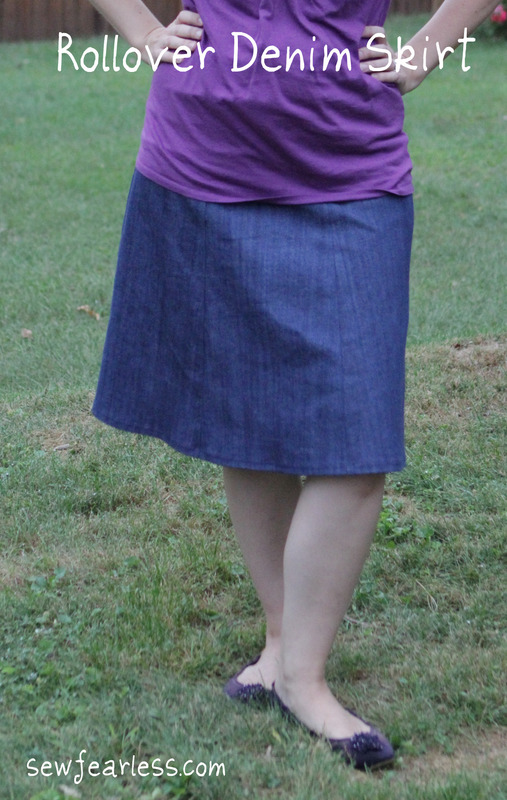 I brought the hem up 2 inches instead of the recommend 1 1/4″. 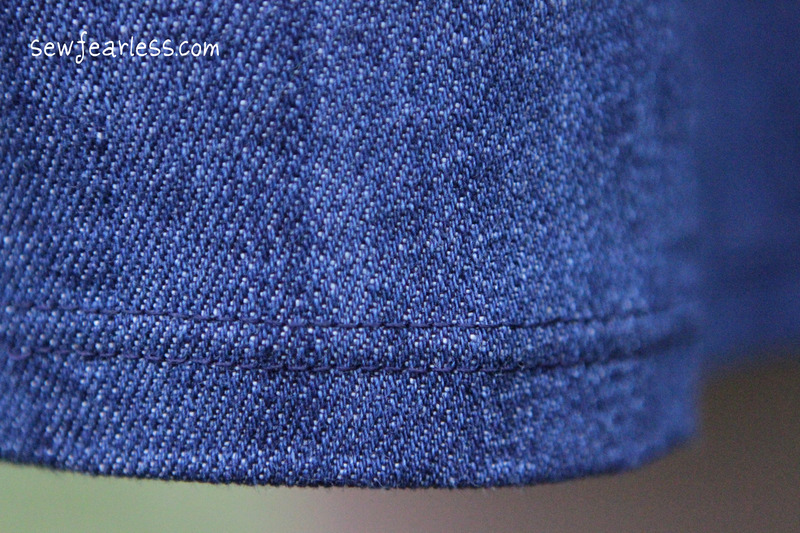 A double folded hem seemed like it would be too bulky with denim. Instead, I folded once and serged the raw edge. I’m also super proud of using a twin needle for the top-stitching on the hem. I can never sew two parallel lines no matter how carefully I try. The twin needle really made it ridiculously easy. It took me all of five minutes to set it up and it saved me a good 15 minutes of painstaking stitching. Working with a double needle. 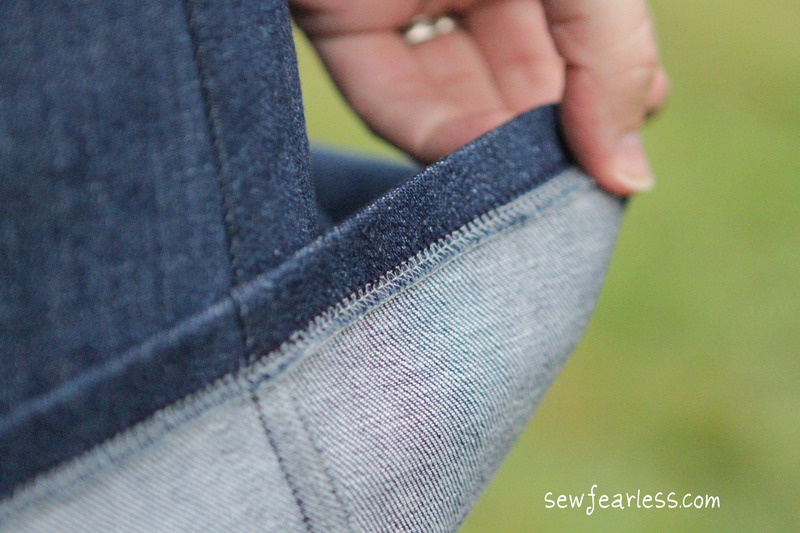 It made for quite the professional looking hem! Finishing before the end of the month. I love this skirt Jodi! It is SO flattering on you. I am VERY tempted to make one for my next pregnancy. You should. 🙂 Super comfortable… now if I can only find some tights I like so I can wear it all winter. I hope you find some cheap pants with your amazing thrifting skills and make some awesome maternity pants for yourself. You will love the walking foot! Nothing scary about it. I imagine it is the same as mine as we both have Brothers. Are there directions included in your machine manual? St. Tabitha, Pray for us! I love the skirt! Beautiful! And I’m so impressed you’re altering patterns to maternity. And I love the baby bump. You are beautiful! Aww thanks Reenie! I’m liking that I’m looking pregnant instead of fat now. 🙂 The frumpy stage is always a tough one. user can be aware of it. Therefore that’s why this paragraph is perfect. Thanks!